The latest installment of firearms training information from Sage Dynamics covers Fetal Position shooting. Their lead instructor, Aaron Cowan provides a thorough overview focusing on the Principals, uses, along with problem solving. Very rarely do uses of force occur in a static situation where positioning and tempo are your decision. If you were to take even a cursory look at the details of self-defense shootings (which the vast majority of shootings are) you would see quickly that the situation that leads to a shooting often begins with a reaction to an aggressor, not an action towards one. An unexpected attack or the decision to use your weapon when faced with a disparity of force, sudden and overwhelming attacks happen. A perceived and instant exercise of violence from an attacking threat or threats in close quarters can and does overload our thinking processes and cause us to do one of two things; freeze or let nature take over. Deep structure programming, our body’s own desire for survival has given us a few tools to protect ourselves and one of those tools is the fetal position. From a very young age, the fetal position is an implicit response to danger, fear and stress. More common in situations where our conscious or subconscious mind has no solution to confront a threat due to lack of training, complete surprise, fear, or inability to confront the sheer amount of violence visited upon us. You don’t have to look very far to find accounts of the fetal position used to defend against dogs, bears, bad dreams, nature and as a reflexive protection to defend against two legged predators when knocked to the ground. As far as our Cave Man Brain is concerned, the fetal position is the most effective way for us to shield our vital organs from trauma; the solid bone structure of the shins and forearms protect the torso while the thickness of the top and back of the skull protect our decision makers. 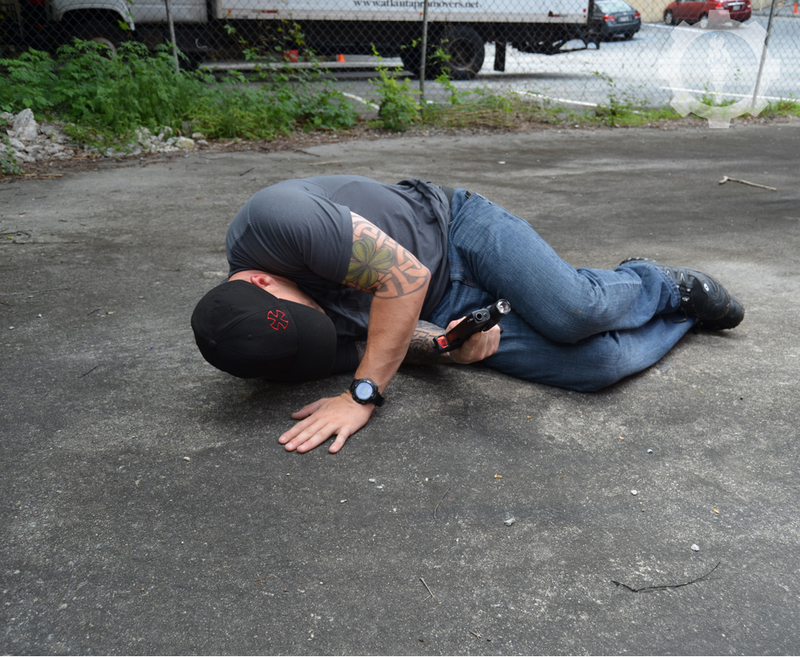 The response to danger is so strong that the fetal position can be a reflexive action when knocked to the ground. The fetal position can also be a reflexive response to situations that our conscious mind knows full well it will be of little use, such as against gunfire. When faced with laying down and taking an attack exposed or doing whatever we can to defend ourselves, our Cave Man Brain will make the decision for us. 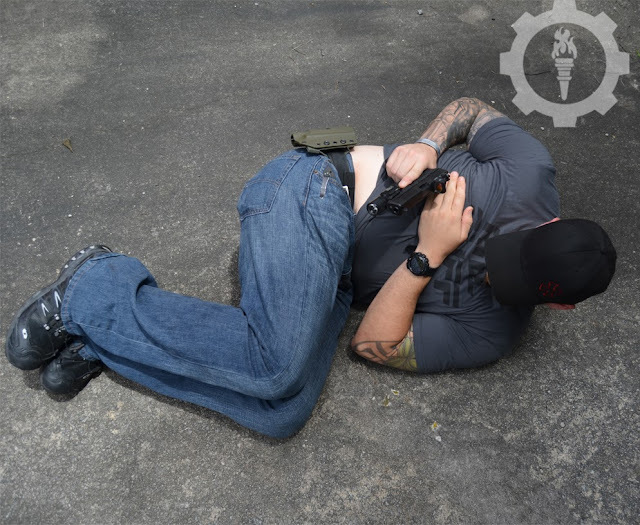 For those of us who carry a firearm for self-defense, either by choice or occupation, the fetal position can serve two purposes; defense against a physical attack after being knocked down or falling, as well as a stable shooting position for use behind small or irregular cover/concealment. The first use of the fetal position is most likely going to be the decision of someone else. 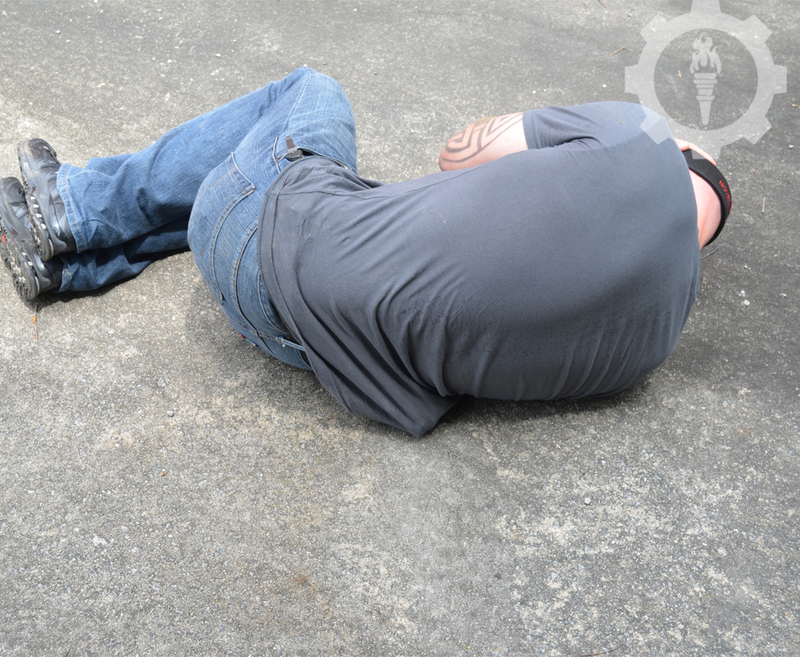 A lack of situational awareness, failure to recognize pre-assault indicators during a contact with another person or a surprise attack from an unexpected source that is physical in nature, may find us pushed or thrown to the ground and in the fetal position as a reflex, especially if the physical attack continues. If the disparity of force is severe and you have a reasonable fear for your life or grievous bodily injury based on your attackers actions (such as kicks, verbals or a physical attempt to strip your weapon) the presentation and use of your handgun may be the only means of stopping the attack. Depending on how you came to be on the ground and which side of your body you landed on/rolled to will dictate the method of your draw. If you are lying on your weapon, the draw will be more difficult than if you aren’t (which kind of seems intuitive). Your cover garment, if any, will also affect the draw. 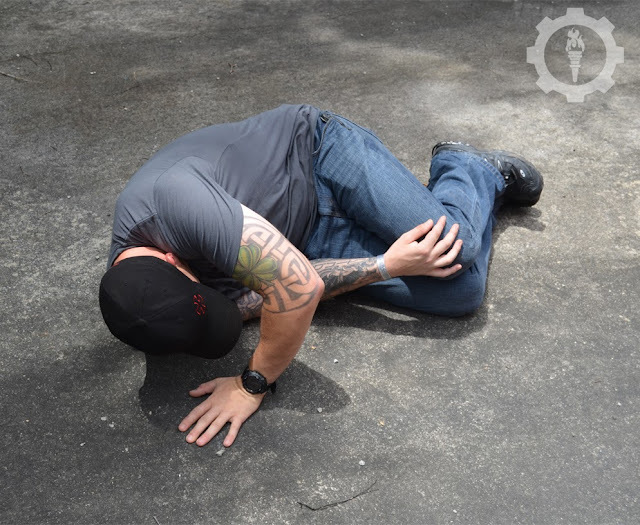 If you can control your fall, or are able to choose a side to roll to or are just lucky and land on your support side your initial and reflexive reaction is going to be to protect the head and torso by curling up. Your first conscious thought should be about your weapon and if it is exposed. If it is, you must take positive control of it despite any blows being received before it is taken. The draw with your weapon (primary) side out is very similar to the draw when standing for hip carried and IWB holsters, though your support hand may not be available to clear your cover garment for the draw. Verbalize as you draw, speaking, yelling, threatening, all force you to breath and the verbalization of a warning may help stop the attack. Sweep your cover garment from the path of the handgun and draw straight from the holster, rotating the handgun at the hip towards the closest threat. Your weapon must be point aimed at an extreme angle in order to hit vital areas of the threat in the event that you have to fire. This requires practice, lots of practice. I have found it best to pivot the arm at the elbow with the upper arm tucked close to the body to provide as much skeletal support as possible. Once the initial rounds have been fired, come to your back naturally with a two handed grip and assess the threat(s). Deliver additional service as necessary and work to your feet (explained later) if prudent. If you are unfortunate enough to land on your weapon (though in certain situations this may actually be preferred) you have two options: draw and point fire across the body while still in fetal or sacrifice natural positional protection to roll to your back and fight from supine. This is a risks versus rewards situation and the choice is largely dependent on you. Practice for both. To affect a draw laying on your weapon, the most efficient method requires exaggerated physical movements; bridging (lifting) the torso at the hips and shifting your body weight forward to the knees while your primary hand sweeps back under your body and clears the cover garment while the support hand braces down across the face for support and protection from blows. 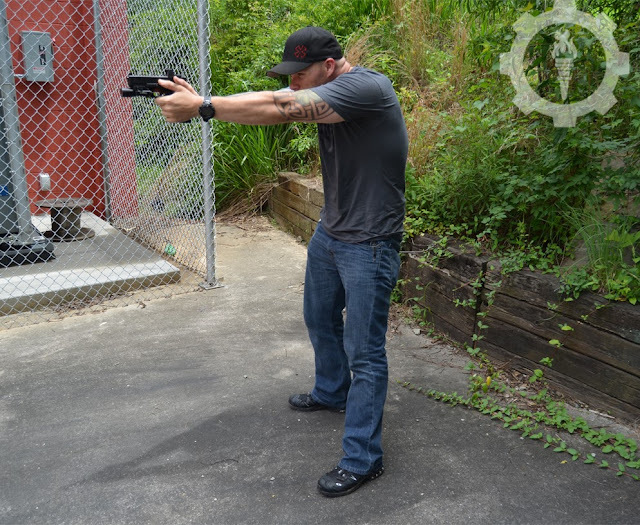 As you clear the handgun from the holster you must bring it back under your body, I cannot stress enough the possibility for muzzling yourself with this draw and the need to practice it. If you find yourself preferring this method over the following…practice, practice, practice. 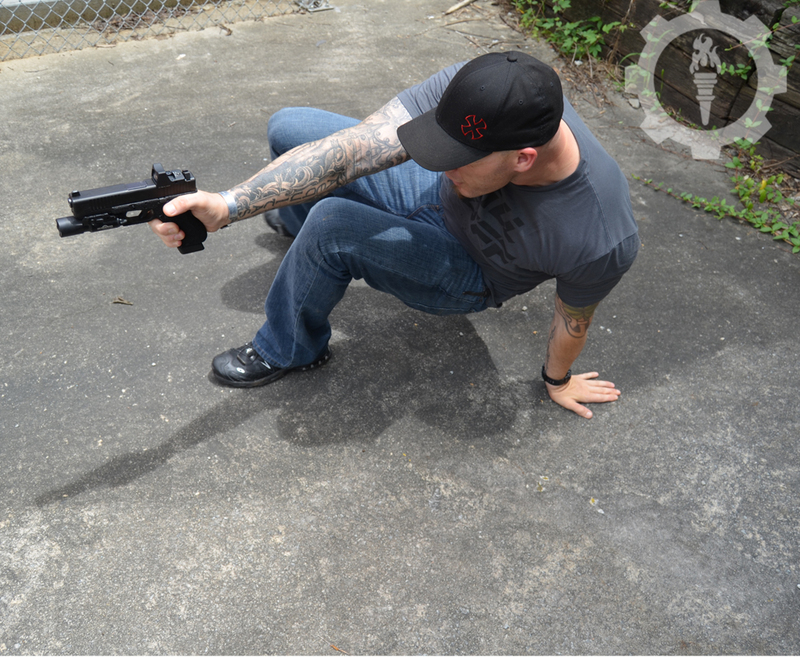 The second technique reduces protection from a physical attack in exchange for faster and safer access to your weapon. 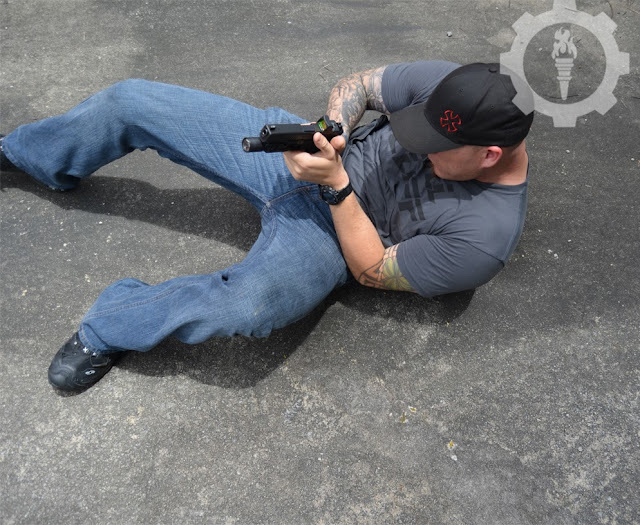 Rolling to your back, you can keep your knees in your chest, or extend one foot to strike your attacker while posting the other out for stability as the weapon is drawn. Once the weapon is clear of the holster, point shoot from the hip if necessary and press out to a two handed grip. The two handed technique coming from fetal is known as supine and can be performed with the legs straight or bent at the knees to provide support. 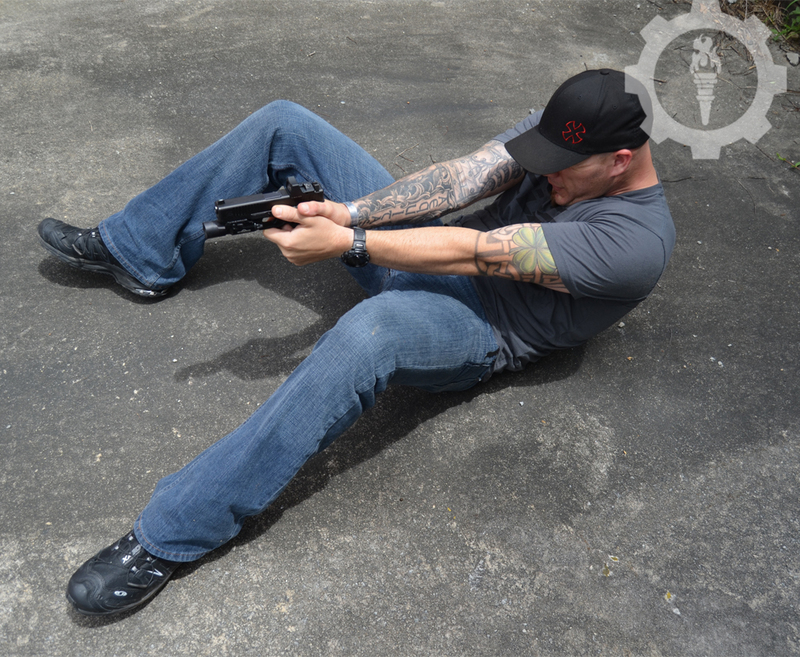 For knees up, make every attempt to push the muzzle past the knees when firing. 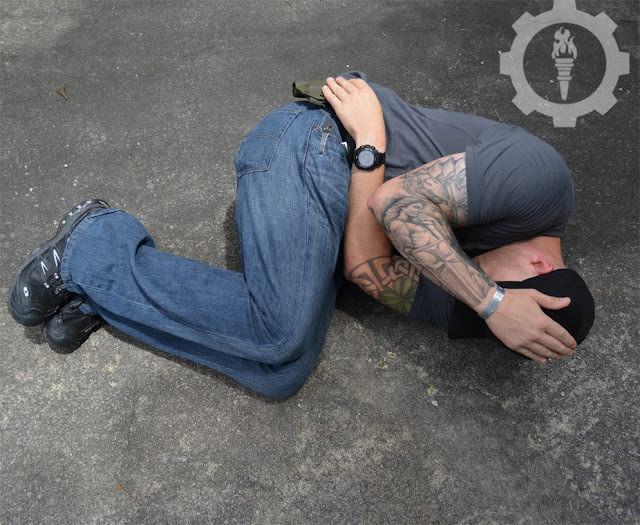 The second use of the fetal position is to utilize cover that is irregular, small or in order to minimize your profile while firing under a low object such as a car or truck in confined spaces where other positions may not work (such as between two vehicles or against a wall). 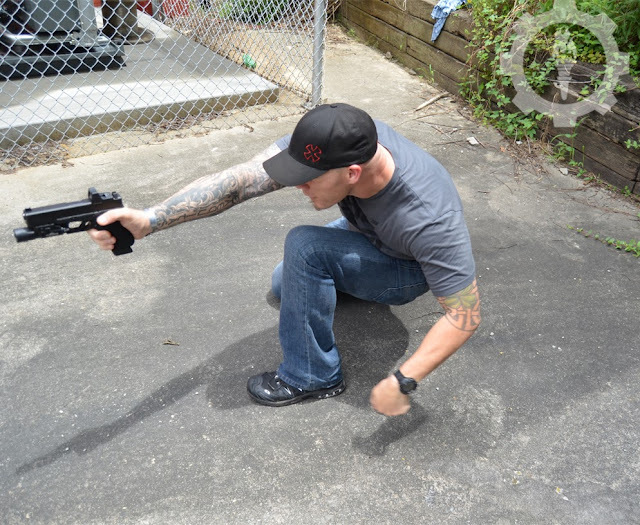 Arms extended firing from the fetal position allows the shooter to brace their grip between their knees, shins or even feet. This position is comfortable and reduces tension on the upper body/arms that otherwise affect accuracy under stress. 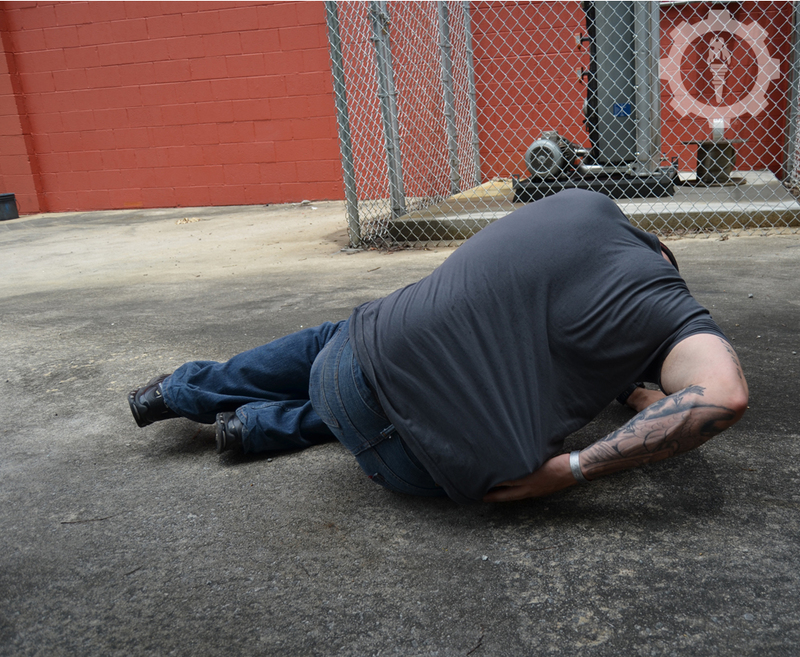 Mobility is significantly reduced however and recovery from this position requires more coordination and movement than recovery from many other positions. An additional aspect that should be taken into account is accuracy. Handguns are designed to be fired with the sights vertical. By rotating the weapon 90 degrees, point of impact from your point of aim will be affected. The bullet will do what gravity and ballistics make it do. At 90 degrees (give or take a few degrees) the bullet is going to strike in the direction of the sights and low, the reason for this is that with the weapon off its factory axis (vertical) the windage becomes the elevation and the elevation becomes the windage. Obviously with most handguns the sights are fixed so you are probably giving me a “WTF?” right now. Bear with me. 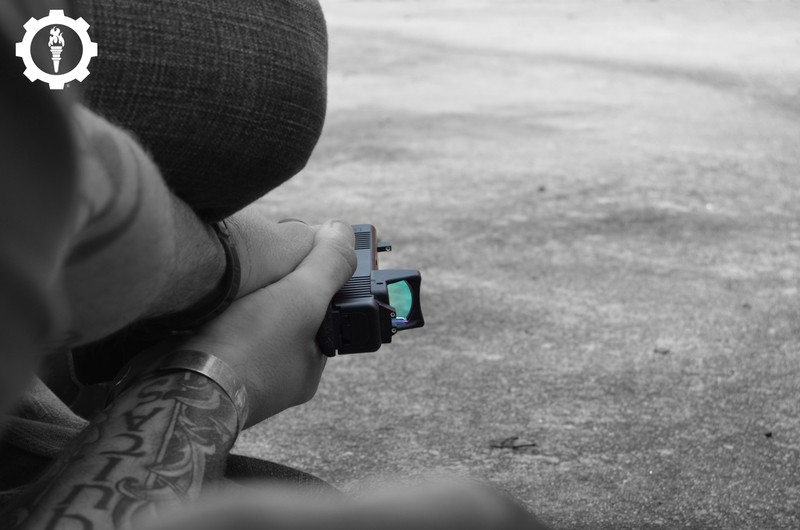 Your handgun was factory zeroed and has elevation compensation figured into the sight height and placement, windage adjustments to the rear sight may also be present. The reason for the round striking in the direction of the sights is that the sights compensate for sight over barrel height and barrel angle. By rotating the weapon you are pointing the barrel angle in the direction of the sights, causing the round to strike towards the sights. The Bullet will strike low because the canting of the barrel affects trajectory (bullet path and drop) and gravity. 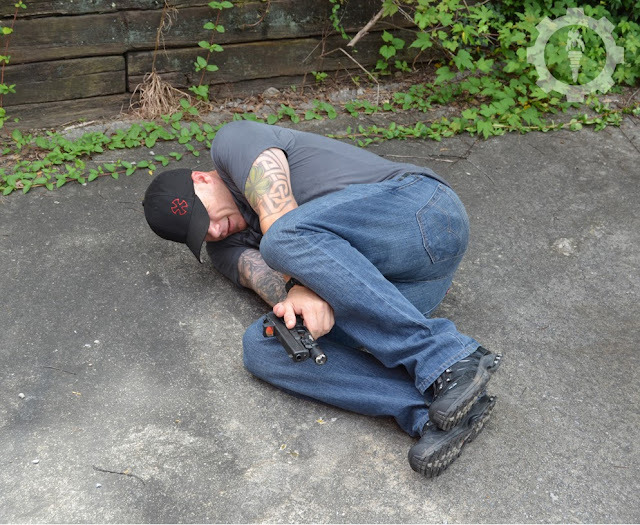 For most handgun ranges, you will never notice this POA/POI difference with the handgun fired from the fetal position, though practice it from as many varied ranges as possible to determine its presence and be prepared to compensate for it if necessary. Finally, When used behind cover, additional stability with the fetal position can be gained by bracing your feet against the cover object to brace your body and provide more comfort for long periods of time. Recovering should be done as slowly and deliberately as the situation allows, which means that in a real world situation you are going to get up fast. Begin by leaning as far forward into your knees as you can while in supine. 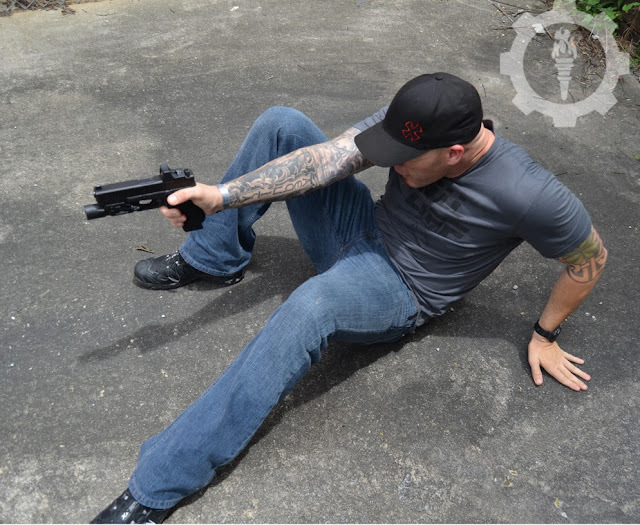 Maintain a primary hand sight picture on the threat and brace out with your support hand, bridge at the hips and pull one leg underneath you, standing or going to a kneeling position away from your threat. Practicing this method will find the most efficient way for you to recover depending on your body type and physical condition. The fetal position is but one tool we can practice to confront austere situations, utilize minimal cover or be prepared for a sudden attack. 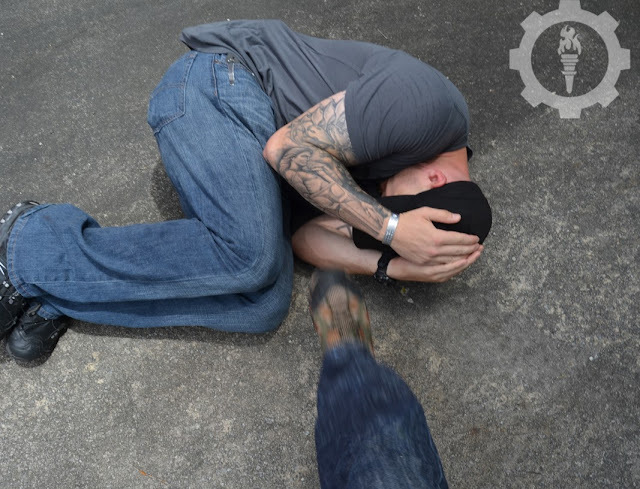 Being knocked to the ground is a sobering thought, especially if you have not been trained to confront the possibility. Because confrontations are rarely straightforward or static, we have to be prepared to fight in all directions from any position. Train accordingly. You can now Pre-Order the Defensive Handgun Fundamentals DVD at SageDynamics.org For regular updates be sure to follow Sage Dynamics at their Facebook Page.